Leftist students at the University of Illinois at Urbana-Champaign showed that “punching fascists” was more than social media bluster by attacking a College Republicans event on campus. 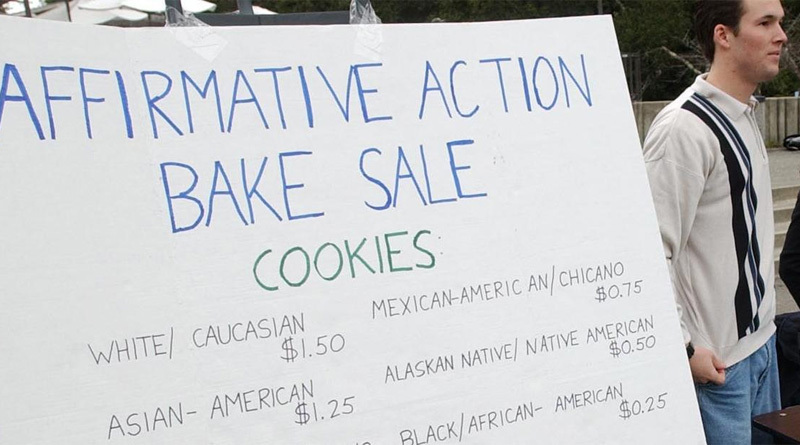 Although nobody was actually punched during the altercation, an unidentified student disrupted an Affirmative Action Bake Sale on campus by stealing a plate of cookies and hurling it to the ground. The conservative club was predictably labeled “fascist” by liberal classmates for holding an “Affirmative Action Bake Sale” on campus earlier this month, but one antagonist took things a step further by physically destroying part of the display, according to a video obtained by Illinois Homepage. The event was intended to start a conversation about affirmative action policies by asking students to pay varying prices for baked goods depending on their respective race, but while dozens of students were engaged in the debate, an unidentified vandal suddenly appeared and threw a batch of cookies on the ground before sprinting away. While the identity of the vandal has not been released, one student posted a poll on his Facebook page beforehand asking friends to indicate how they “plan on protecting [their] campus” during the bake sale, listing “punching fascists,” “stealing cookies,” “punching fascists and also stealing their cookies,” “memes,” and “non-violent debate” as potential responses. The most popular response by far, boasting at least 39 votes before the post was removed, was “punching fascists and stealing their cookies,” with eight other students selecting one of those two options exclusively. Notably, this is not the first time the College Republicans have been subjected to harassment for their political views. When confronted with a reality that is in opposition to the indoctrinated cultural marxism, some become emotional & irrational. Dylann Roof had a similar wake up. Teaching lies to the kids is causing red pill reactions when they learn the truth about big lie of Black victimization. MSM are warping reality with so much fake news.